I design and create alot of cakes for baby showers and first birthdays. It’s a big exciting moment in life that requires nothing less than a big exciting cake to celebrate. Cake for a safari themed baby shower. Baby animals are totally edible, made from fondant/gumpaste. 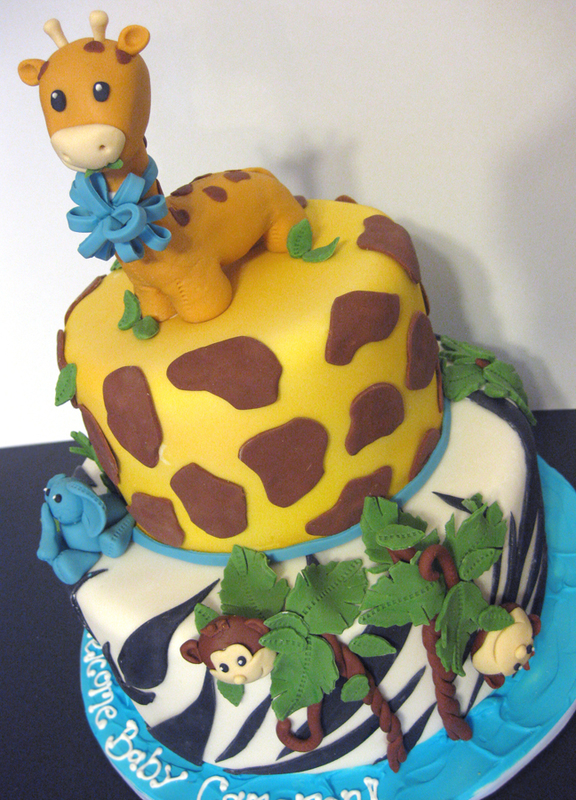 A view from the back of the safari baby animals cake. Twin boys’ first birthday cake along with two matching ‘smash’ cakes. 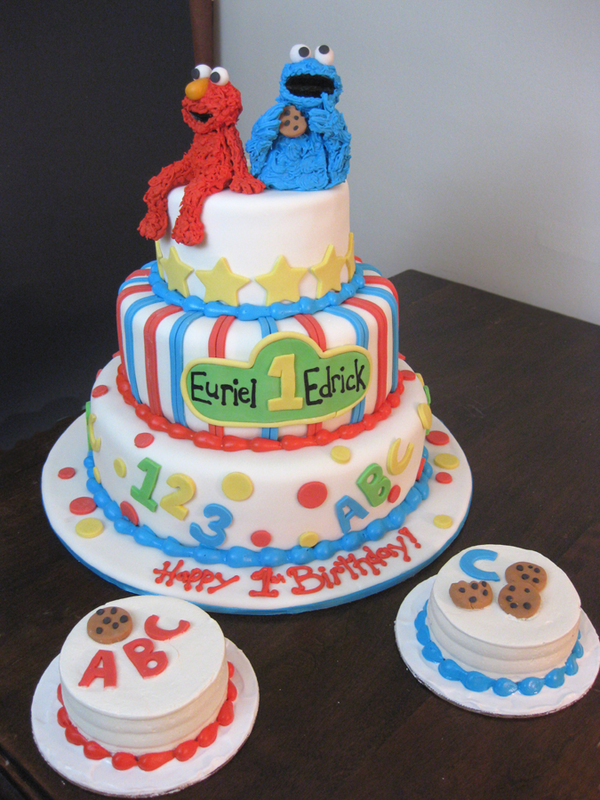 The theme/decoration of the party was red and blue, and Elmo and Cookie Monster. C is for Cookie, yum yum yum. 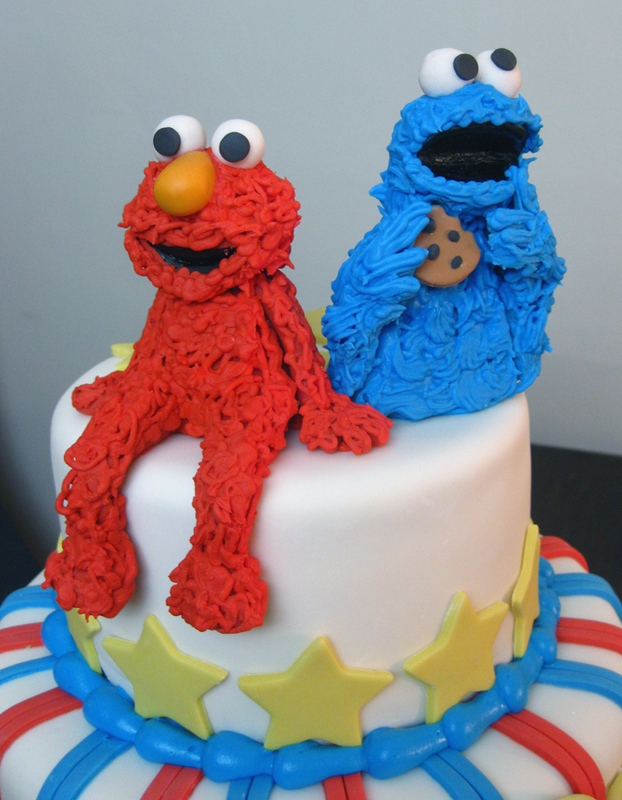 A close up of Elmo and Cookie Monster figurines made totally from sugar. 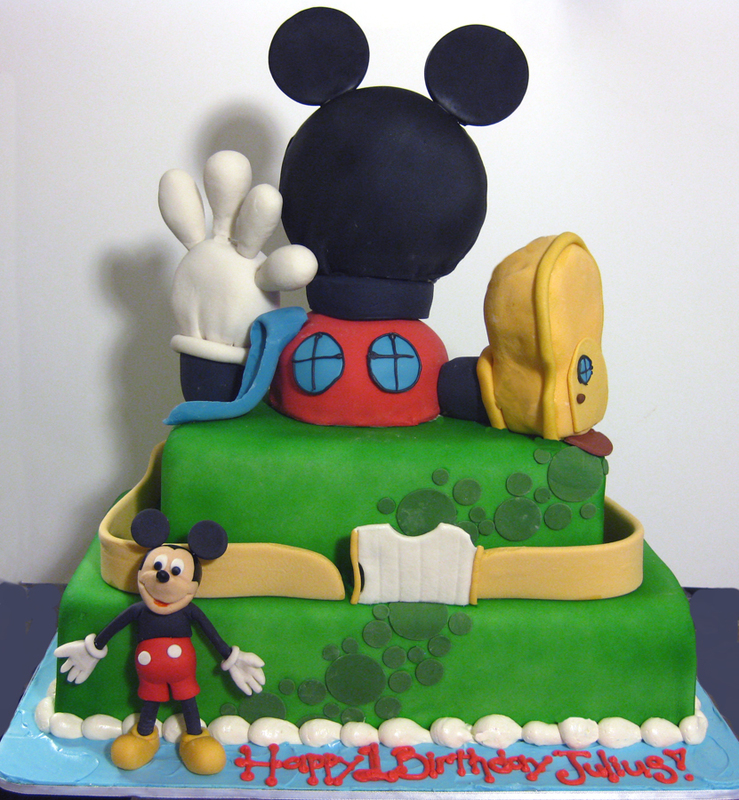 Mickey Mouse Clubhouse cake for a little boy turning one whose party was everything Disney, especially Mickey Mouse. The Clubhouse topper is made entirely from rice crispie treats covered in fondant. 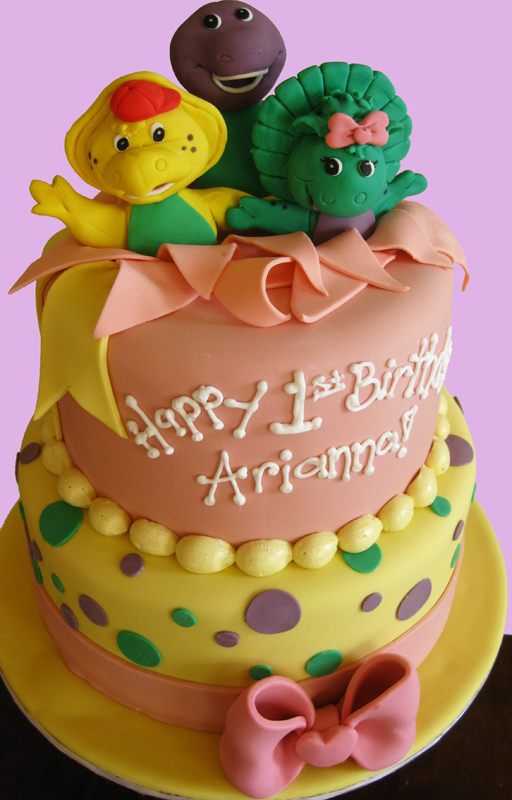 Barney themed 1st birthday cake. The cake is a simple vanilla cake with vanilla meringue buttercream. 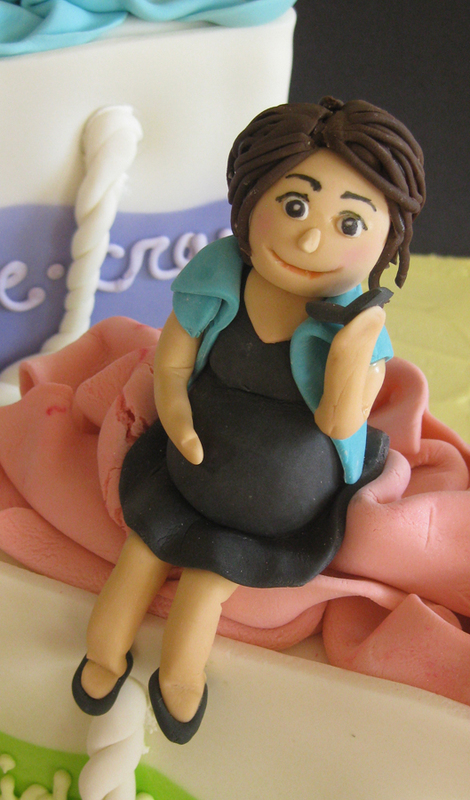 The figurines are made fondant/gumpaste mix as is the Baby Bob bow at the base of the cake. This 3-tiered cake was for a Cat in the Hat themed 1st birthday party. From the base to the top of the candle this cake stood almost 2 feet high. All decorations are edible. An extra cool detail about this cake was that the middle tier was red velvet cake with cream cheese buttercream filling so that when sliced it mimics the red and white striped hat. 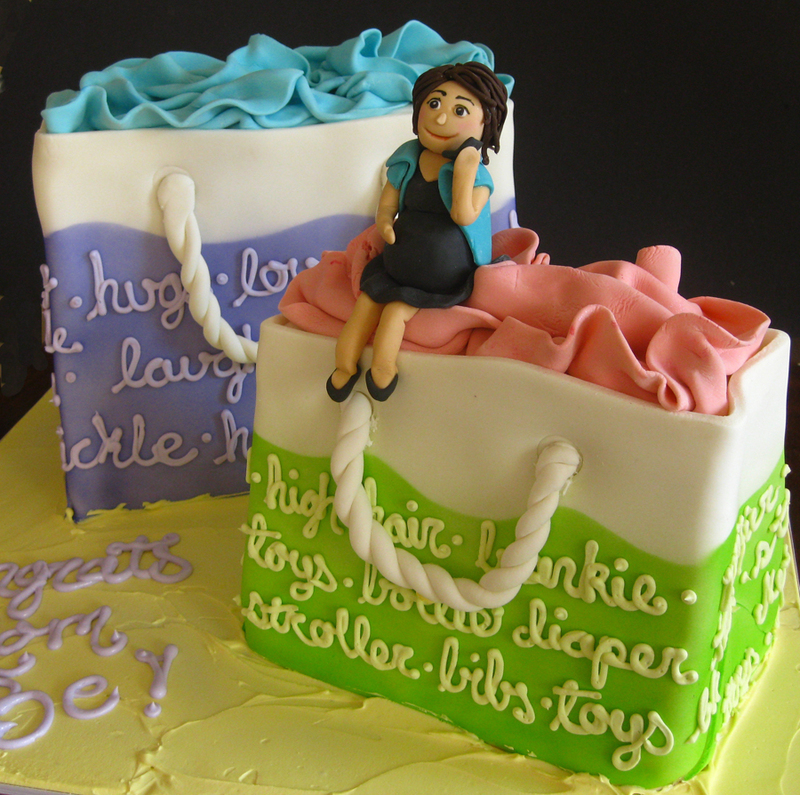 2 shopping bag shaped cakes for a chic/modern mom themed baby shower. Baby words decorate both bags filled with tissue paper. The figurine of the mom is holding a cell phone, per request of her sister because she’s always on her cell phone. A close up of the mom-to-be. 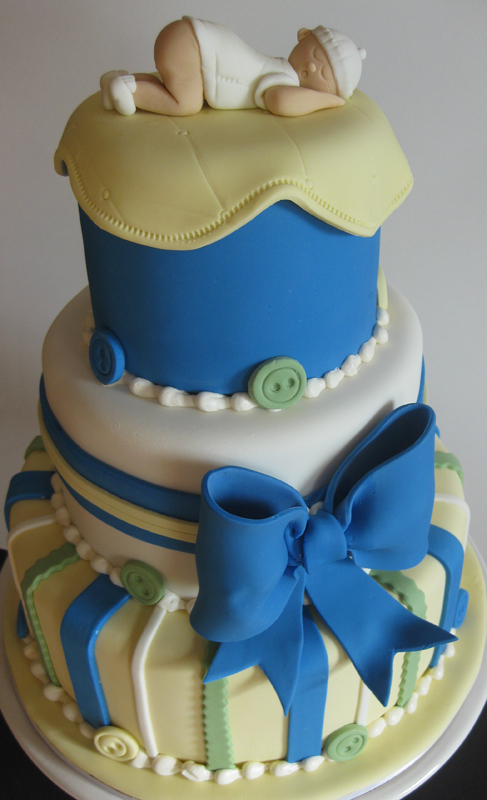 The baby boy on the top of this cake was inspired by the mom-to-be’s favorite Anne Geddes baby picture. For the rest of the cake we took inspiration from her fabric samples both for the colors and other elements such as the rick rack, buttons, ribbon and the baby blanket on the top. What a great Dr. Seuss cake! LOVE it! ABSOLUTELY LOVEEEE! the safari cake. It matches my son’s room theme perfectly. adorable! 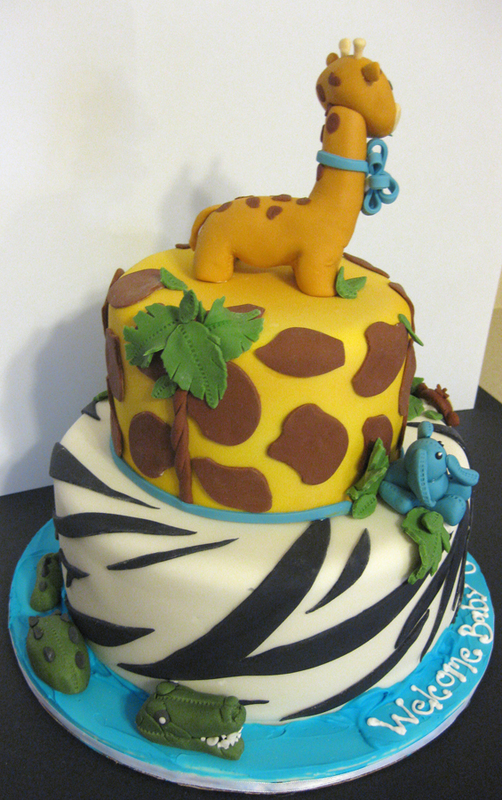 The safari cake is adorible really I absolutley love giraffe’s thats what we are going with as the theme to my first baby’s shower. I love the cat and the hat cake! My sister is turning 4 and we are making a Mickey Mouse clubhouse cake like yours,thanks for the inspiration!! How much is the twin cake? It’s actually for my son turning 2 in September. Can you mail them?